I often find myself using the popular hashtag, #targetdoesitagain. These pretty papers, pencils, and pens may just be some of my favorite Target finds ever. The colors, patterns, everything about them are perfect. Also, they're from the dollar section in Target, so yay for that! I have yet to try out the pens and pencils to see how they write, but I figured that even if they're not the best, they will still look pretty being showcased in the monogrammed pencil holder (from Design Darling) on my desk. And, you can never have too many notepads. What is your favorite Target find ever? Everything is so cute! The Target dollar section is the best. Target always has the greatest desk accessories, so many fabulous finds in the dollar section! 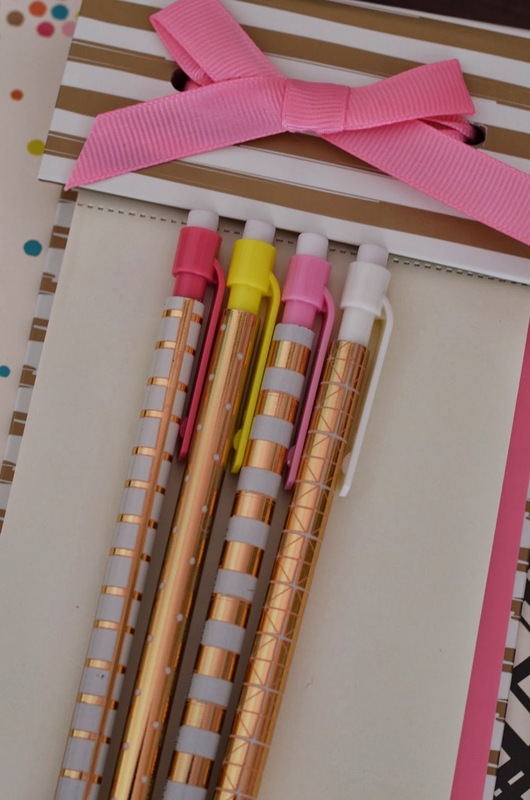 All of this looks amazing - the pens and pencils are beyond adorable! Target offers so much cute stuff! I love all the ute pens, pencils, and stationary that Target has! I own a bunch of pens similar to the ones you have - just with different patterns! Oh. my. gosh. those pens are soooooo cute! I will look for them next time I'm there!! Love Target dollar section too! I always buy one big birthday gift for each of my nephews and my niece then head to the dollar section in Target to pick up a few other fun items. It's budget friendly and they always have great seasonal toys and accessories for kids. I checked my local Target for all those items but they were already sold out :-( SO cute though! I have those pencils from Target! I bought a few packs because I thought they would brighten up the pencil cup on my desk a little bit :) They are kind of squeaky, but write really well, and the eraser is great! I wish the Target I was at would have had the matching pens and notepads. I love these! Too cute! Now I need to make a Target run ASAP. I'm obsessed with everyone's finds from the Target dollar section - I wish we had one here in the UK, everything's just too cute!